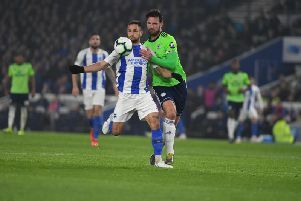 Greer, who has been at the club since 2010, has been part of a successful Brighton side this campaign and they currently sit top of the Championship with no defeats in 19 games. That run has now seen them move level with Queens Park Rangers to the record number of games unbeaten in a single season. Should Albion avoid defeat at third-placed Derby County on Saturday they will hold the new record for most number of Championship games undefeated at the beginning of a campaign. And Greer believes this current Albion side has all the credentials to continue fighting at the top of the league. He said: “Through my time here I’ve been very fortunate to pay with some really good teams, but as far as the squad, manager, staff, and the club, as a whole it’s a great time to be here. “We have a fantastic squad with great players and have a real belief to challenge and do something. Albion face one of their toughest runs of the season with three games in seven days. First, Brighton make the trip to second-placed Derby on Saturday before a trip to Queens Park Rangers on Tuesday then a home clash with Middlesbrough, who sit second, four days later. Greer is one of the few players who played for Albion in their 4-1 play-off semi-final second leg humiliation at Pride Park two seasons ago. But this time around the Albion skipper is hopeful his side can come away from the clash with something. He added: “It was a really disappointing day as a person and for the club, you look back at these things a take something from it. “When you suffer a setback you learn from it and move on. “Derby have done really well this year and have a great squad but we’ll be going there knowing we can do something.